China just announced a national carbon market. Who can we blame for climate inaction now? As part of his visit the United States this week, China's president Xi Jinping will be announcing the country's intention to initiate a national carbon trading program starting in 2017. China is the world's largest greenhouse gas emitter, and setting up a cap-and-trade program will have global reverberations—possibly becoming the first step in a successful international carbon market that will prove effective in combating human-caused climate change. This is a big deal for the community calling for swift, meaningful, and coordinated action on climate change. It is also a big deal for climate change deniers, like many Republicans in Congress, who have repeatedly used the scapegoat argument that if China isn't doing anything to fight climate change, then it's pointless for the United States—the world's second largest greenhouse gas emitter—to do anything. Just last week leading Republican presidential candidate Donald Trump said that China is "doing nothing about" climate change. According to Trump, other countries are also "doing nothing about it." Even the pope's recent call to action didn't sway the Republican party on the issue. On Thursday, Trump also said that the pope is wrong about climate change. Jeb Bush, another presidential candidate and a Catholic, said the pope shouldn't discuss climate change because "he's not a scientist." As the Republican party stalls on climate action as if their lives depend on it, the Obama administration has been working hard with their counterparts in China to cooperate on the issue, and in doing so, to bring other nations under the fold. The global climate summit will be held on Paris at the end of the year, and the more evidence of action that is on the table there, the greater the likelihood for a successful outcome. 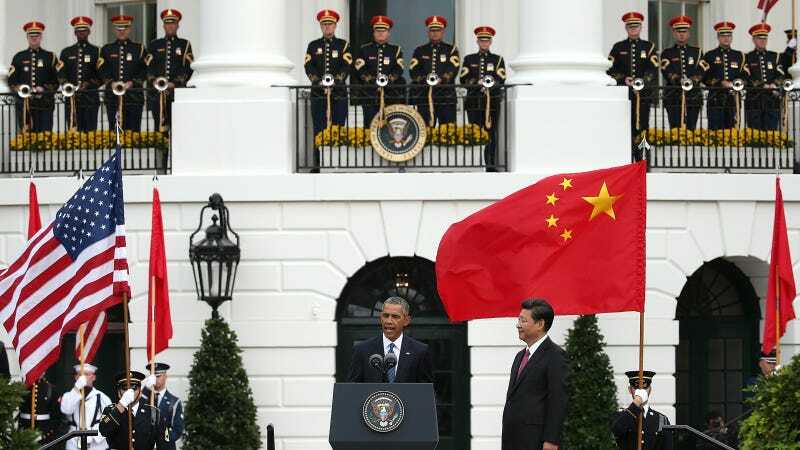 At the end of 2014, China and the U.S. signed onto the US-China bilateral agreement on climate change in which Obama set the target of cutting greenhouse gas emissions by 26-28% below 2005 levels by 2025 and China agreed to peak CO2 emissions around 2030, with the intention to try to peak early. Since then, both countries have strengthened their positions. China has been testing cap-and-trade programs at the city and regional level for several years in the build-up to a national program, which will likely become the world's largest carbon market. As the New York Times reports, there have been challenges with these pilot programs, and there will be major challenges to enacting a successful national carbon market. So that's one thing Republicans may find hopeful: that China's carbon market will fail. Then they can look back and say that doing nothing was, in fact, the best non-action they could've not not taken. Of course, in the meantime, the impacts of climate change are likely to get noticeably worse. It's already almost certain that 2015 will be the hottest year on record—and it was definitely the hottest summer in recorded history.